Where do I even start? This was my first time going to Fan Expo and it was all pretty spontaneous. I only actually got my tickets the Monday before it was happening and originally planned to only go on Sunday. Then I was looking through the schedule and there was a lot going on on Friday and decided, why not? And you know what? I’m so freaking glad I went! Friday was pretty much non-stop for me. I took the train in and, since I’d bought my tickets online, I had to go exchange them for wristbands which wasn’t nearly as confusing as I thought it would be as there were tons of signs all pointing to where people needed to go for certain things. 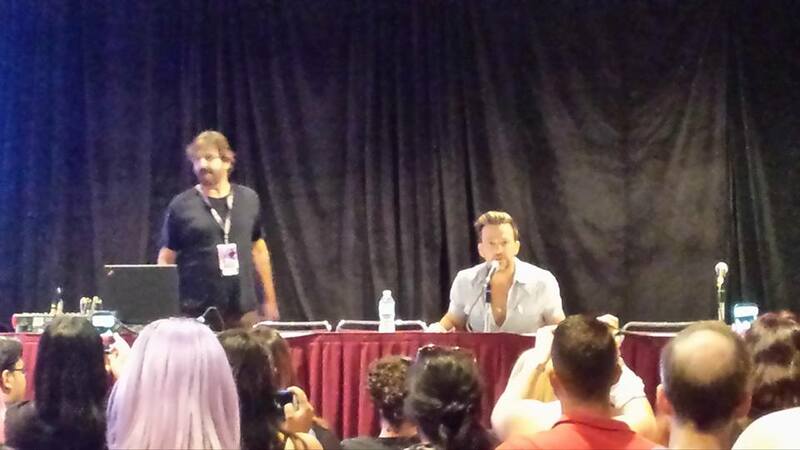 So, skipping all the boring stuff about trying to figure out the map and me getting lost, the first panel I went to was The Boondock Saints panel with Sean Patrick Flanery and David Della Rocco. This panel was amazing! If any of you have read my review about the first Boondock Saints film then you know I’m a huge fan of these guys so seeing them in person had me completely freaking out (internally of course). The panel lasted for an hour and was better than I could ever have imagined. Both these guys are hilarious! Rocco (David? That sounds weird to me) sat back for most of it, but when he did talk it was golden with discussions about peanut butter and salad dressing. Sean was amazing and answered every question genuinely. Also he likes Tim Hortons which, as a Timmy’s addicted Canadian, this made me very happy. They talked about various projects and antics they got up to, Sean talked a bit about his book coming out next year, and it sounds like Boondocks 3 is definitely in the works so I’m incredibly excited about that. Also at this panel I met the two girls who run boondock_girls on Instagram and you guys should definitely go and check them out! From there I went to a panel called “Steakpunk 101”. I didn’t actually learn what Steampunk was until recently and I didn’t really understand it at all until I went to this panel. However, I have an idea for a novel that I’ve kind of unintentionally been incorporating Steampunk in to and am glad I now understand it better so things make more sense. It was a really interesting panel featuring several members from different Steampunk societies and groups and I really enjoyed it. I learned a lot and am looking forward to exploring this topic more for my novel. 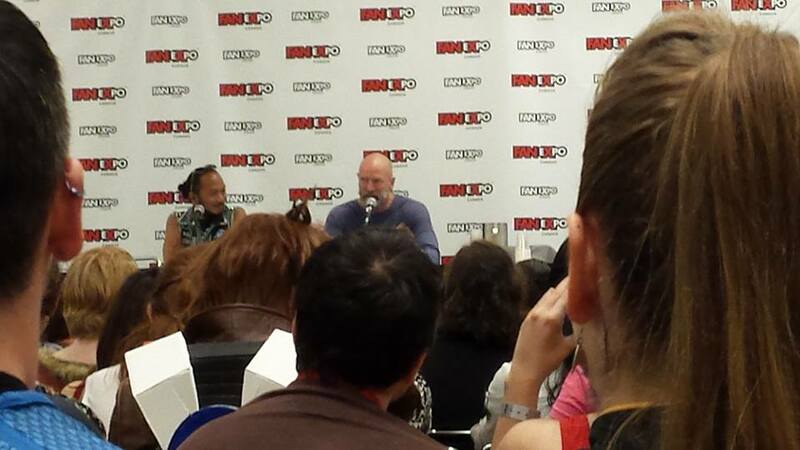 After that it was on to another celebrity Q&A, this time with Graham McTavish from The Hobbit and Outlander. Now I’m going to be totally honest and say that I didn’t know he was in Outlander as I haven’t watched. I want to, it definitely looks like a great show and I hear all these great things about it, but I just haven’t had the chance yet. After being asked what the most physically demanding scene he’s had to film was, Graham McTavish said that it happened during The Hobbit. In the scene where they’re running from the Wargs in the field they’re loaded down with all this heavy gear and shoes that are too big to add dwarvish proportions, they had to run. For weeks. Everyone died. I feel so bad for the actors having to film this, but that’s absolutely hilarious. The other story also involves Peter Jackson. Apparently Peter Jackson owns an old tank that he’s restored and Graham and some others were over at his place firing guns and just hanging out (the police had been warned beforehand) when Peter Jackson decided to take the tank for a spin. It started out innocent enough until he started driving it through Wellington! Now I tried to picture what this would look like and I couldn’t. I also couldn’t stop laughing. Just imagine being one of the people living in Wellington when this happened and you look out your window to see a massive tank driving down the road at night. 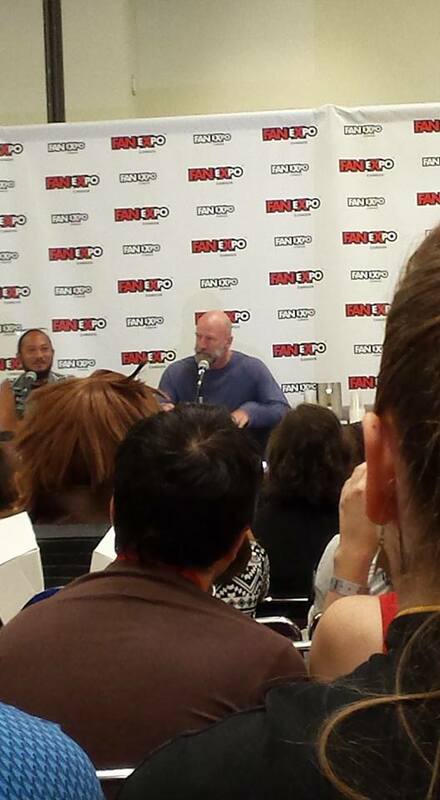 Apparently the police showed up later and Graham McTavish said they seemed kind of bored. I guess this is a regular thing with Peter Jackson which I think is something I should be surprised about, but after all these years of hearing and reading similar stories, I’m not. After his panel I went to one called “Writers Unite!” Jim Zub, Ray Fawkes, and Charles Soule were the guys running the panel and they basically talked about comic book writing/designing, what that process is like, sending it off to people, making connections, etc. Anyone who reads this blog knows I’m a writer of many things (mainly novels). But what some of you may not know is that I’ve been interesting in trying to create a comic/graphic novel/zine or something along one of those lines. This panel helped me so much and the ideas haven’t stopped flowing. All of three of these guys weren’t originally looking at comic design as a job originally (one of them even went to law school! ), but that’s where they are now. This panel not only helped me with ideas and understanding comic book writing better, but it also really helped me with my novel writing since they talked about not making it right away and the different things they went through. Zub, Fawkes, and Soule were amazing and I highly recommend checking out their twitters which I have listed below with everyone else I talked about in this post! 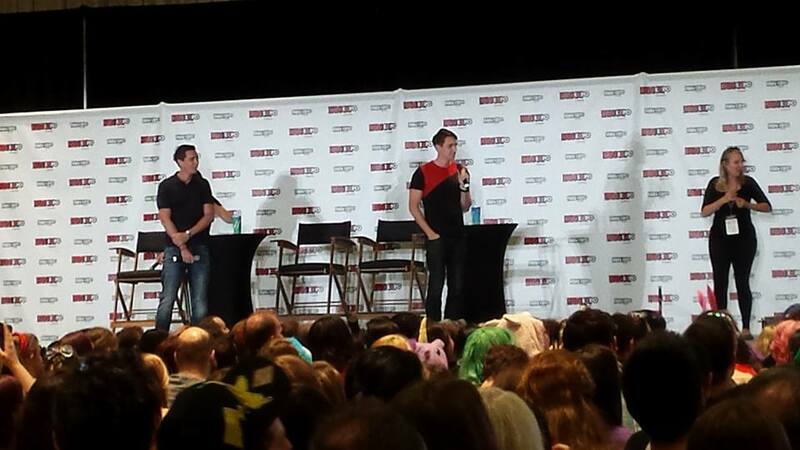 The last panel I went to on Friday was for James and Oliver Phelps AKA The Weasley Twins! 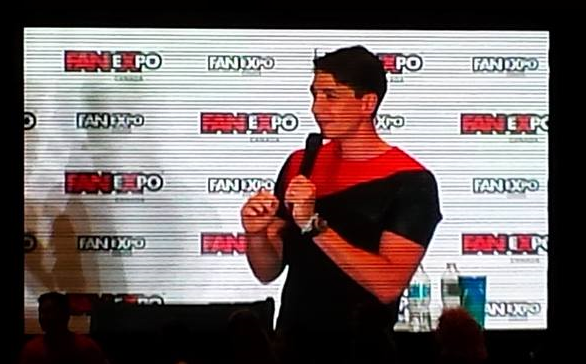 Even though I was there at the panel, it didn’t actually hit me until Saturday that I had been in the same room as two of the guys from Harry Potter! It was such a surreal moment. These two guys are hilarious which definitely makes sense after playing two jokers for so many years (they did the first Harry Potter when they were just 14!). They answered a bunch of questions and told some great stories including one where none of their school friends believed they were in Harry Potter even when the dyed their hair red. Another was the story of how *spoiler alert* James found out Fred died in the final book. Apparently they were given no heads up and they were actually on a train on holiday somewhere just after the seventh book came out. James was reading the book and got to the part where his character dies! How horrible would that be?! Someone also asked them which death was the hardest in all the films. Hmm, yeah, I wonder? Fred’s of course! I would love to tell you more about all these panels, but I was a little too in awe and blogging was kind of at the back of my mind. The main thing I kept thinking was “I am mere feet from [this person]” and it was insane. 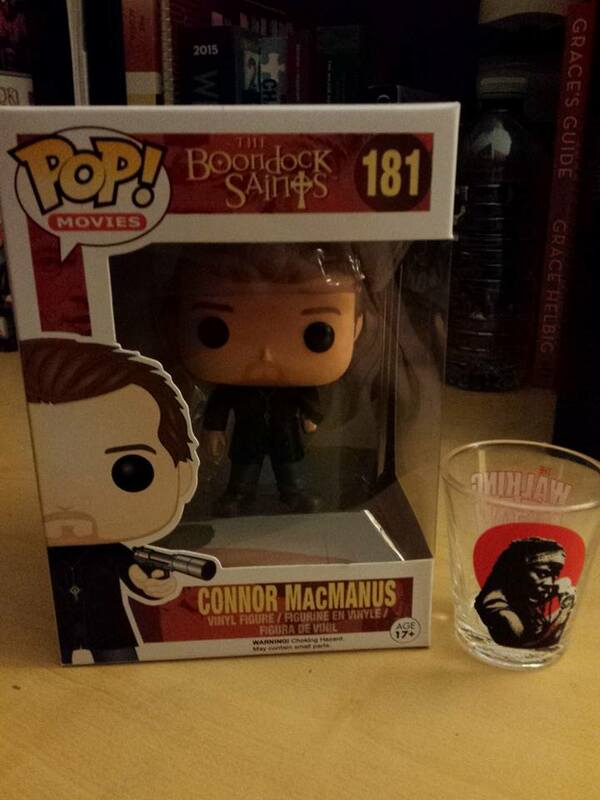 This is a Connor MacManus Pop Vinyl figure from the Boondock Saints and a Walking Dead shot glass. For anyone who doesn’t know I collect both of these thongs. So far my shot glass collection has far more to it than my Pop Vinyl collection which really isn’t saying much as I have this Pop figure and a Daryl Dixon one. I don’t know how this guy was doing it. 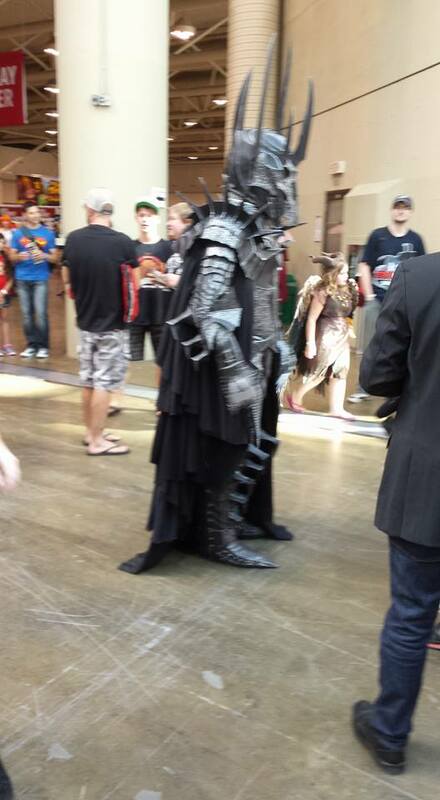 I was in a tank top and shorts and I was dying of heat so kudos to this guy for walking around in full Sauron gear. I didn’t take anymore pictures of cosplayers because it was either too crowded or I was too in awe of what I was seeing and by the time I remember they’d already be gone. Seriously though, to anyone out there who cosplays, well done. I applaud you. I don’t know how you do it. The amount of time and money that must go into these costumes is crazy and I can’t even believe it. Amazing job. 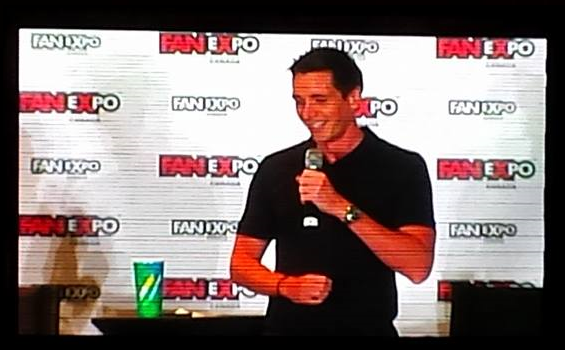 I had such a great time at Fan Expo on Friday! It was so much greater than I ever could have imagined and I’m so glad I decided to go. 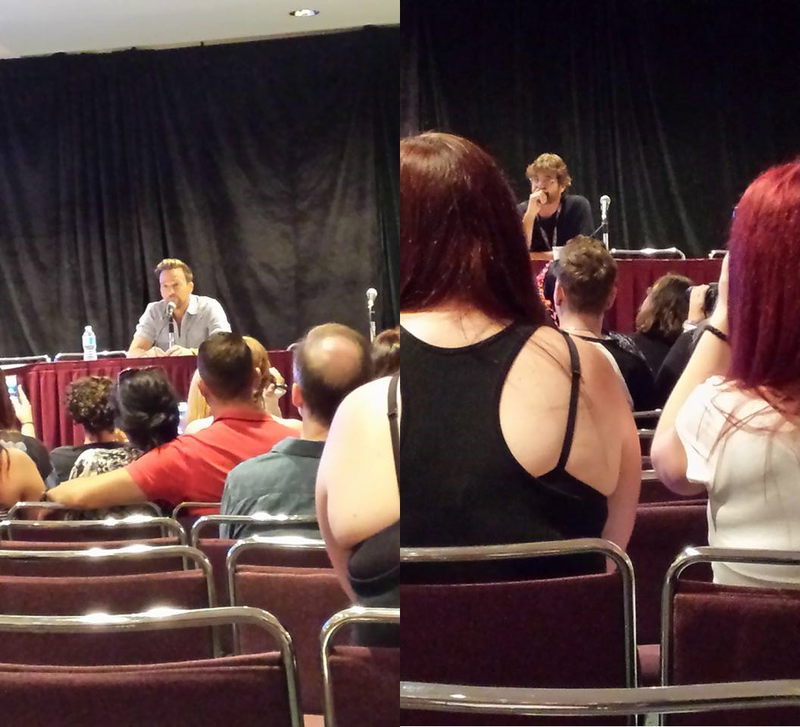 I’ve never blogged about a convention before, but had planning on blogging about the Supernatural convention and decided to practice with Fan Expo! I’m hoping if I go to any conventions next year I’ll have a professional camera and know more about what I’m doing. I’ll be posting about Sunday soon! 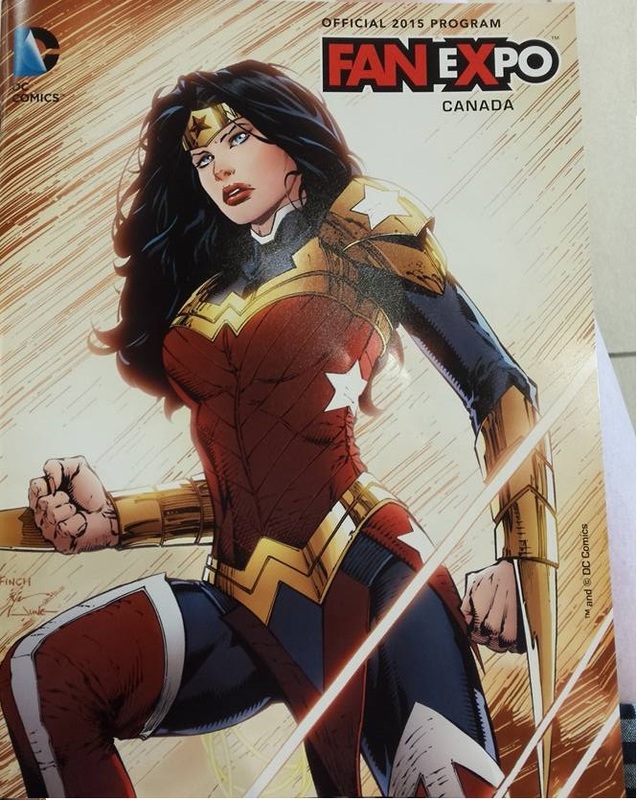 Hope anyone who was also at Fan Expo this past weekend had a great time!